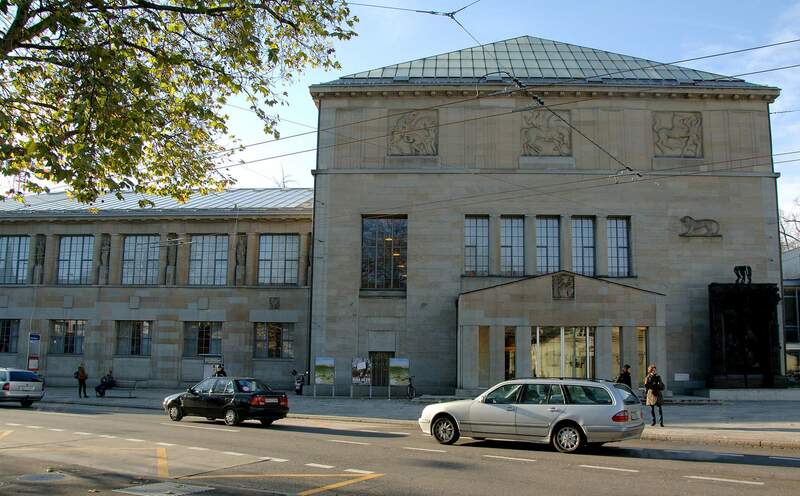 "All people should have access to all forms of art"
On April 1, Kunsthaus Zürich is having an open day based on the motto 'Art and integration.' Gallery educator Madeleine Witzig will be guiding visually-impaired people through the Kunsthaus. But even during her tours, touching is the exception. She wants to address all the senses, so that both sighted and visually impaired people are on equal footing. Madeleine Witzig, you are not visually impaired. How do you know what interests people who are? Madeleine Witzig: I assume that people who come on one of my guided tours are interested in art, and that they regularly engage with it. Very often they are older people for whom visual impairments have manifested with age. I don't invent special themes, but offer the same tours as always; I also prepare as normal, develop the theme, the art history relevance. There are guided tours that are set up more like workshops, where we sometimes also experiment with sounds – such as what a color could sound like. But, in general, I am a very precise verbal translator and explain in as much detail as possible what there is to see. But something must be different. Yes, of course I make sure that I speak clearly, not too fast. The guided tour is two hours long – it is very strenuous if the information is absorbed almost entirely through hearing. We generally take more time, starting with welcoming the guests. The tours also start on Mondays, when the Kunsthaus is closed to the general public. That way it is calmer. We now offer a guided tour for all major exhibitions together with the 'Zürcher Sehhilfe' (Zurich association for the visually impaired). It used to be two guided tours per year, and now it is six. Why do guided tours for visually impaired people even exist? Of course, fine art works through vision. People who don't see well might benefit more from other forms of art, such as theater or music. But we believe that all people should have access to all forms of art. That is why we have created this offer, and we look after their needs as much as possible. But what we don't offer is three-dimensional replicas of pictures that can be touched. There are museums that do that, but it is an entirely different concept. I know that my guests appreciate having someone knowledgeable accompany them and take them seriously intellectually. Just because someone is older, slower, and can't see so well anymore, doesn't automatically mean that they are intellectually impaired. It is about seeing people on the same level. Of course, safety is always a concern. Every participant has a companion with them. But to be honest, safety is always an issue – even with children or adults without impairment. The title of your tour promises quite a lot. Seeing with your ears, OK. But looking with your hands? We have a couple of selected figures made from different materials that we are allowed to touch; unfortunately none made of stone – that would just be too difficult. One of the guided tours includes three different female figures, which is especially nice. But I have noticed that people with visual impairments are particularly hesitant to just reach out and touch the artwork. The ban on touching something in an exhibition is deeply ingrained. But there are rules for touching, as well. Wiping movements are not allowed, because they damage the patina too much. But brief touching with the fingers is allowed and we don't even have to wear gloves for that – it is enough to wash the hands. In addition to sight and touch, we also have the senses of smell and taste. Do you also involve those? Certainly with still lives, all five senses are involved. The Dutch, in particular, represented these with symbols and objects. All the food that we see there – the flowers, the animals – whole universes are depicted there. For children, I often use objects that they can touch, smell, and get to know. But adults, whether they are visually impaired or not, have a greater wealth of experience, so it is enough to let them touch the lemon first: What do they feel? That way, we recognize the difference between a lemon and an orange very clearly. Then I cut it and the sense of smell comes into play. The only thing that you don't recognize without being able to see is the color of the lemon. The lemon speaks to all of our senses: You can hear how I peel it, you can taste, smell, and touch it. So I open up the world of a still life to my guests using a lemon. Do the participants of your special guided tours have other questions about the art? Not really. There are people who want to know more about the technique – those who might paint themselves. Everyone gets something different out of an exhibition. In that respect, there are no differences between sighted and partially-sighted people. For me, it is always important that we take the pictures and artists seriously. Engaging with art is a lesson in life. When we look at something in detail, we form a bond – and even a type of love. It enriches our lives. A visit to the Kunsthaus can also be an echo chamber for our existential questions. Then, the question of whether we see everything without impairment or limitations could even become secondary. On April 1, 2017, the Kunsthaus Zürich open day, Credit Suisse is inviting deaf and visually impaired people to special guided tours of the collection so that they can enjoy an interesting art experience. Credit Suisse has partnered with the Kunsthaus Zürich since 1991. The art historian Madeleine Witzig has been working as a gallery educator at the Kunsthaus Zürich since 1999. She gained her teaching experience from working as a primary school teacher and as a music teacher trained at the conservatory. She guides groups of adults as well as children and adolescents, be it in the context of school, professional development, or leisure. There are regular themes on display, with pieces from the collection and in the current temporary exhibitions. The format could be a one-hour teaching tour, but mostly it is a two-hour art discussion or a didactic tour with a workshop. The guided tours for visually impaired children and adults, which she has been offering at the Kunsthaus Zürich for many years together with the 'Zürcher Sehhilfe,' are particularly close to her heart. March 27, 2017, 2:00 p.m.
April 3, 2017, 2:00 p.m.
April 10, 2017, 2:00 p.m.
Credit Suisse wants to make access to its products and services easy for everyone and aims to achieve the greatest possible accessibility for people with impaired eyesight, hearing or mobility. This applies for branches and ATMs, the internet, online banking, account statements, and advice. In Switzerland, there are around 500 talking ATMs, which make it easier to withdraw money or find out an account balance. For visually impaired clients, there are account statements in large print (15 pt.) or braille. This service is available for extracts from account statements, itemized account statements, standard account statements, and daily statements. Deaf clients can use a sign language interpreter during a personal consultation twice a year, free of charge. Center of Accessibility (center.accessibility@credit-suisse.com) or at telephone number 0848 880 840. Is active "All people should have access to all forms of art"